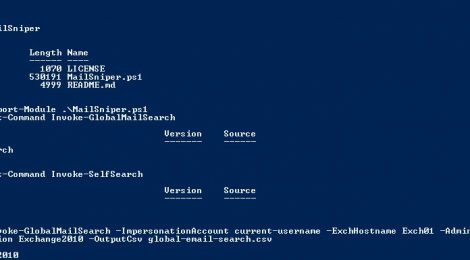 Browse: Home / MailSniper is a penetration testing tool for searching through email in a Microsoft Exchange environment. There are two main functions in MailSniper. These two functions are Invoke-GlobalMailSearch and Invoke-SelfSearch. * Invoke-SelfSearch is a module that will connect to a Microsoft Exchange server using Exchange Web Services to gather a number of emails from the current user’s mailbox. It then searches through them for specific terms. This could potentially assist in privilege escalation after obtaining a user’s credentials or assist in locating sensitive data as a non-admin. ← The Social-Engineer Toolkit (SET) v7.3.15 Codename: ‘Underground’.